Our Customers speak highly of our products & services. 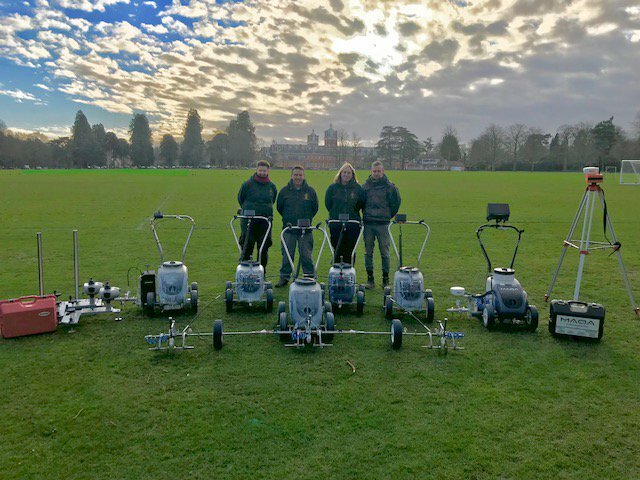 “We have been a Fleet customer for 20+ years and have always been impressed with the quality of the paint we use for pitch marking. "Turnaround of our 18 winter pitches at Wellington College has always been a time consuming and labour intensive affair. We have five pitches available for various sports usage throughout the summer lets period, these can regularly change from rugby to football and any other pitch they require and requests are often at short notice." "Turnaround of our 18 winter pitches at Wellington College has always been a time consuming and labour intensive affair. We have five pitches available for various sports usage throughout the summer lets period, these can regularly change from rugby to football and any other pitch they require and requests are often at short notice. Once this has finished we need to initial mark 14 rugby pitches, 3 football pitches, a lacrosse pitch and 3 lots of training grids during August for the start of the Michaelmas Term in September. At Christmas we need to change some of our rugby pitches over to football, then at Easter we need to initial mark 8 rugby pitches for a week-long Rugby Festival. Once that is over we need to initial mark our 400m track, javelin and discus in a very quick turnaround for the start of the summer term. GNSS line marking is something relatively new on the market and I researched the prospect of using this new technology to our advantage. As a site which is heavily wooded, part of Bracknell Forest, I realised from previous experience with GPS technology that trees can be an issue when locking onto satellite signals. I was hopeful that the advantages would outweigh the disadvantages and decided to arrange demonstrations from two companies, Fleet (Line Markers) Ltd. MAQA being one of them. An obvious choice, being a customer of theirs for many years. After the demonstrations from Fleet and a rival company the first thing I noticed was the Fleet Marqa paint was extremely durable and, even after two weekends of heavy rain and regular mowing, the lines were still bold and bright on the tennis court we marked out on our cricket outfield for the demonstration. The other was that MAQA uses GNSS and software for superior accuracy. When it came to cost, the offer from Fleet was a better deal, so I went with them. The MAQA equipment arrived quickly comprising the MAQA Kombi marker, a tripod, a heavy duty case which contained a Samsung tablet and GNSS receiver as well as the necessary battery chargers etc. and a large quantity of Marqa paint in bags. Training was given on-site. I initially tried the MAQA on our Lacrosse pitch which had faded away to the point that it would have needed initial marking again, 45 minutes later and it was marked. This would normally have taken two of us 3 hours from squaring up, measuring and marking. 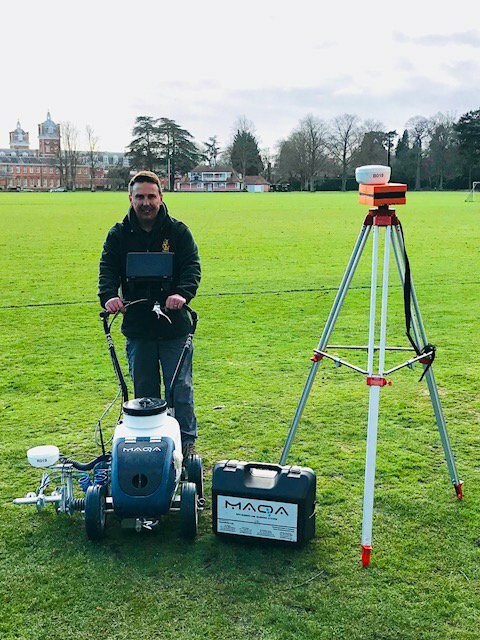 Bearing in mind that this was my first use of the MAQA and therefore slower than someone who regularly uses it, I was very pleased at the savings in time and labour, I have subsequently used the MAQA on the lacrosse pitch and I marked it in about 25 minutes. The best test was on our five Derby Field pitches which needed converting from rugby to football. After initial marking three pitches relatively quickly, I managed to initial mark the fourth and fifth pitches in around 20 minutes each. To say I was pleased with the savings in time and labour would be an understatement. No checking right angles, no measuring. Just set up the GNSS receiver on the tripod wait 15-20 mins for full satellite lock and away you go. Just select the line you want to mark on the tablet mounted on the marker and mark, very simple. It’s amazing that you don’t even have to mark the outside “box” first. You can start anywhere, the centre circle, the “D” on the 18-yard box if you want, the choice is yours. As you complete marking each line it is ‘greyed’ out so you always know which ones you have marked and which ones are still to be marked. If there is anything I am not sure about, the tech guys are at the end of the phone or email are absolutely first class. I am extremely pleased with the MAQA GNSS marking system. I can now initial mark all of our pitches, single-handedly at a fraction of the cost in terms of labour and time. Along with the MAQA GNSS marking system we also have two Fleet Beamrider Laser Markers and five Kombi Orange and an athletics track boom to enable three lanes to be marked simultaneously. We also use Blinder concentrate, and in spite of trying other paint, we have always reverted back to Blinder. It isn’t a cheap paint but, it is bright and very durable and rain resistant. I am also a big fan of their aerosol paint, again, I have used cheaper products that are more hiss than paint or cans that clog up or run out of gas before all the paint is used. Fleet aerosol paint is bold, bright and every drop of paint is used before the propellant runs out. "Since purchasing the MAQA I have been very impressed with the overall performance and accuracy of the equipment. As this is state of the art technology which is relatively new to the market, it has exceeded my expectations." Since purchasing the MAQA I have been very impressed with the overall performance and accuracy of the equipment. As this is state of the art technology which is relatively new to the market, it has exceeded my expectations. Initial and ongoing set-up of the machine is easy and efficient and it is very user friendly. At Brunel the demand for various sports exceeds the number of pitches at any one time, for instance, on one occasion we had to green out a Lacrosse and an American football pitch and mark two Rugby Union pitches from scratch. This had to be completed in one day - The MAQA helped to complete this task within 4 hours. Don't let the minimum monthly charge put you off of leasing the machine as it saves so much manpower especially if you have a small team and you have a lot of line marking to do in a short time frames. The fleet team are also able to customise various templates if required. “I have been a Fleet customer and user of Fleet products for over 30 years. I have always found their paint, line markers and customer service to be of an excellent standard.